To Cite: Fathi M, Saeid Rezaee-Zavareh M, Sharafi H, Hesamizadeh K, Karimi-Sari H, et al. Tehran Hepatitis Conference: An International Meeting with the Goal of Middle East without Viral Hepatitis, Hepat Mon. 2016 ; 16(11):e40539. doi: 10.5812/hepatmon.40539. The Middle East (ME) is a region consisting of 17 countries with different levels of economy, populations and health status. Some countries are involved in a civil war, which can directly affect the health conditions of the region (1). The ME is considered as a region with intermediate to high endemicity regarding the hepatitis B virus (HBV) infection (2, 3). Also, Egypt has the highest prevalence of the hepatitis C virus (HCV) infection in the world (4). Furthermore, Pakistan and Azerbaijan, neighboring countries of the ME, are countries with high HCV prevalence (5). These findings show the importance of liver diseases in the ME region and emphasizes that some activities are needed to control this health problem. On the other hand, with the revolution in the HCV treatment, there is great hope for elimination of the HCV infection (6). Specialists and healthcare workers need to get updated data regarding epidemiology and treatment of viral hepatitis periodically. This will help manage the issue and reduce the prevalence of viral hepatitis. One can be establishing a scientific journal (7). Holding international conferences can also be considered in this context. The Tehran hepatitis conference (THC) is an international conference affiliated to the Iran hepatitis network (IHN), Middle East liver diseases (MELD) center and some other collaborating organizations (8). These organizations aim to help related specialists in the field of hepatology all around the world, especially from the ME, to update their knowledge about the hepatitis diseases. In this paper, we have provided a report of THC6 and its history, as well as reported the advantages of using a computerized software for holding such conferences. On January 2009, a conference regarding the diagnosis and treatment of the hepatitis B and C infection was held in the Razi Convention Center in Tehran, capital of Iran. Subsequently, the conference was renamed to THC and the second conference, 2nd THC, was held on October 2009 and covered more topics regarding all types of liver diseases. Additionally, distinguished speakers from Germany, USA, UK, Italy and Switzerland attended the 2nd THC. In the 2nd THC, an award entitled the Kowsar Award was defined for a person with lifelong efforts for research in the field of hepatology. In THC2, it was conferred to Professor Mario Rizzetto, from the University of Torino, Italy. Rizzetto discovered the delta antigen and antibody (9). Table 1 shows winners of the Kowsar Award in each THC. In THC5 and THC6, a separate part in the conference has been considered for young investigators in the field of hepatology (Figure 1). Participants in this part presented their posters or lectures. Then young referees, with the guide of some professors, select the best oral and poster presentations (Figure 1). Furthermore, in the 6th THC, a new award entitled the Yas Award was considered for young investigators with the most activity in the field of hepatology and it was dedicated to Dr. Christine Hartoonian. For more details about each THC you can visit the following website: Http://www.thc7.ir. Here we present some data regarding the 6th THC with more details. It is clear that holding a congress needs a powerful executive team. This need can be more felt in the international congresses, which involve many human resources as member of this team. A special computerized software can help an executive team of congress and reduce both the number of human mistakes and consequently the need to have a high number of people in the executive team. The company of Radin Pasargadae technology group has presented a computer software for the aforementioned purpose and called it Radin online congress. This software can help for the following items in each congress: online registration, checking for presence of participant and presence duration in a congress as well as an announcement regarding any related subjects during congress via short message system (SMS). For example, if a participant has a presentation, which can be oral or in the format of a poster, the software automatically sends a SMS to him/her regarding the time and location of his/her presentation. On the other hand, and with help of this software, other participants already have the whole program of congress on their own smart phones, which allows them to check and participate in their interested program. After the end of a lecture, participants can download the related files of that lecture, voice file of lecturer or power point file of presentation, easily from their cell phones. Participants, which may have a problem connecting their cells to the internet network, can use desktop computers in the place of congress for registration, getting their required information etc. The registration fee in this system can be simply paid via the unstructured supplementary service data (USSD) code. However, paying through electronic funds transfer at point of sale (EFTPOS) or in cash will remain as alternative options. One of the important advantages of this software is related to holding an internet based survey (question and answer) for a special topic during or at the end of a lecture. Participants can use their cells and reply to proposed questions. Simultaneously, they can check the results and statistics of the related survey on their own phones. Finally, all participants can download the main files of congress, similar to an abstract booklet and any brochures or catalogs from the internet on their cell phones. Version 1.0.0 of this software has been used in 6th THC. Here we present some data related to 6th THC, which have been extracted from this software. The 6th Tehran Hepatitis Conference (THC6) and first global hepatitis community meeting (GLOB1) were held at the Razi convention center, Tehran from the 27 to the 29 of May 2015. An additional day was held at the Sina and Sadra Convention Center, Shiraz on the 30 of May 2015. A total of 1,791 people participated in the conference, of which 828 were female. As expected, the most number of participant were from Iran (N = 1772). Participants were in different academic degrees. A total of 250 medical specialists and 143 subspecialists participated in the conference. In the THC6 and GLOB1, 182 submitted abstracts were received through the conference website, which 54 (29.7%) were accepted for oral presentation and 123 (67.6%) for poster presentation. 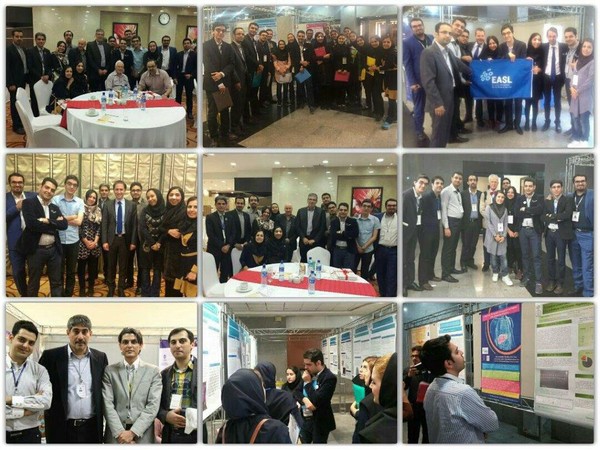 The conference had invited speakers from Iran (n = 76) and also other countries as followed; Mario Rizzetto, Mario Mondelli, Pietro Lampertico, Maria Rendina and Massimo Colombo from Italy; Bijan Eghtesad, Hatef Masoumi, Robert Gish and Blaine Hollinger from USA; Hadi Karimzadeh, Frank Tacke and Michael Roggendorf from Germany; Behzad Hajarizadeh, Maryam Alavi, Gregory Dore and Jason Grebely from Australia; Markus Peck and Peter Ferenci from Austria; Siamak Seddigh-Tonekaboni, Peter Karayiannis and Ashley Brown from UK; Pascal Pineau and Philippe Roingeard from France; Cihan Yurdaydin from Turkey; Marek Jan Los from Sweden; Azzam Kayasseh from UAE; Behzad Yeganeh from Canada; Mahmoudreza Pourkarim from Belgium and Sajjad Rahnamaei from Netherlands. In addition, THC6 had participants from Italy (n = 4), Iraq (n = 3), Australia (n = 2), United Arab Emirates (n = 2) and Qatar (n = 2). Also, Lebanon, Russia, Armenia, India, Bangladesh and Germany, each had one participant in the 6th THC. It should be noted that this rate of foreign participations is different from international invited speakers. Some important topics, which were presented in the THC6, are new treatment options for HCV infection – direct acting antiviral agents and interferon, update on HCV vaccine, Iranian experiences regarding the HBV prophylaxis in newborns, challenges in characterization of immune response and development of new therapies for the hepatitis delta infection. Registration was performed through different methods including: congress website and before beginning the congress (n = 1018), on the first day of congress and with help of related operators (n = 536) and finally by the cell phone of the participants (n = 237). The use of cell phone is an important part of computerized holding of congress with the software of Radin online congress. It certainly needs more training and announcements from the executive committee to all participants. Most people participated in the 6th THC free of charge. However, amongst the people who paid the registration fee, payment was performed through USSD code (n = 96), EFTPOS (n = 310) and in cash (n = 206). A total of 347 people registered in the THC6 as young investigator and 16 students were responsible in the scientific committee of young investigators to manage the oral (n = 10) and poster (n = 40) presentations related to this part. The first day of THC6 and GLOB1 (Best of EASL Day) was dedicated to the collaboration between IHN and European association for the study of the liver (EASL). In the first day of the conference, the Kowsar Award 2015 was awarded to Peter Karayiannis and Yas young investigator award was awarded to Christine Hartoonian. In the last day of the THC6 and GLOB1, the best poster presenters were selected, which included Behrouz Ataei, Sareh Zhand, Elmira Ghoujeghi and Parisa Shoaei. Also, the best young investigator poster presenters were selected, which included Ali Namvar, Sepideh Ghodoosifar and Ali Adib. The seventh THC will be held on September 2017 in three cities of Iran including Tehran, Birjand and Shiraz. Organizing and scientific committees of the 7th THC welcome participation of all related specialists and scientists all around the world and believe that sharing knowledge through such conferences is necessary for improving the health status of the region. One of the important messages of this conference, a part of IHN (http://www.hep.ir), is "aware today, alive tomorrow". Meisam Fathi was a member of the executive committee of the THC6 and also founder and project manager for designing the software of Radin Online Congress. Mohammad Saeid Rezaee-Zavareh and Hamidreza Karimi-Sari were members of the young investigators’ scientific committee. Seyed Moayed Alavian was president of congress and also consultant for designing the aforementioned software. Heidar Sharafi was the executive manager and Khashayar Hesamizadeh was the scientific coordinator of the conference. Javad Karimi was the technical manager for the software of Radin Online Congress.